Most lakes and ponds in our area are thermally stratified much of the year. This means warmer, less dense water forms a layer near the surface. A layer of water with an abrupt temperature change (the thermocline) prevents the cooler bottom layer from mixing with the warmer surface layer. Lakes and ponds in the southern US typically have dissolved oxygen levels near zero in the bottom layer. Bringing water from the bottom layer to the surface will help to de-stratify the lake and oxygenate this water as it is exposed to the atmosphere. Aerating and circulating the layers speeds decomposition of organic material, precipitates phosphorus, helps prevent fish kills caused by sudden mixing of the layers (“turnover”), and allows deeper areas to be inhabited by fish, aerobic bacteria, and other organisms. Aerating the deeper areas of the lake will be particularly beneficial if additional organic material and nutrients are added through a feeding or fertilization program. If a substantial proportion of a lake or pond is eight feet deep or more, the water can usually be aerated and circulated more efficiently with a diffused aeration system than with a surface aerator. Diffused aeration systems use air compressors connected by weighted tubing to diffuser manifolds—similar to those used in aquariums and wastewater treatment—to circulate water and prevent stratification. As the bubbles rise from the diffusers, they move water from the bottom of the pond to the surface. When this water is exposed to air, oxygen is absorbed and noxious gasses are expelled. Placing the diffusers in deep water will result in a large circulation pattern, which means the system will aerate and circulate water more efficiently than it would in shallow water. We sell and install high-quality Kasco® Robust-AireTM units, which come with low-maintenance diffusers and either ground or post-mount cabinets for the compressors. Although the electrical outlet and all electrical connections must be installed by a qualified electrician, PFS can install the compressors and place the diffusers in the best areas to maximize efficiency. Because we price the weighted tubing by the foot, the final cost of a system will depend on the location of the electrical outlet and compressors. The compressors are low maintenance and will often save money on power bills in the long run compared to a surface aerator system. 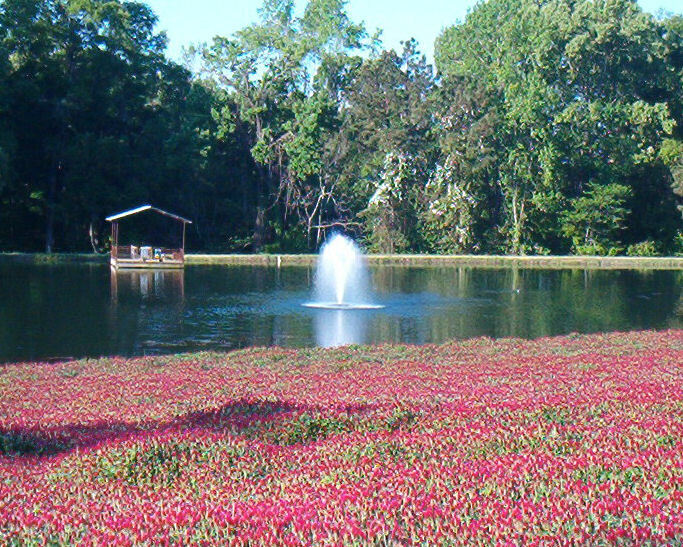 Surface aeration can be used to efficiently aerate and circulate water less than eight feet deep, to provide refuge areas on large water bodies during times of low dissolved oxygen, to further improve water quality when used in combination with a diffused aeration system, or to simply provide a beautiful display. We sell and install Kasco® fountains, which have nozzles available in a variety of patterns to produce the desired visual effect or to optimize aeration efficiency. 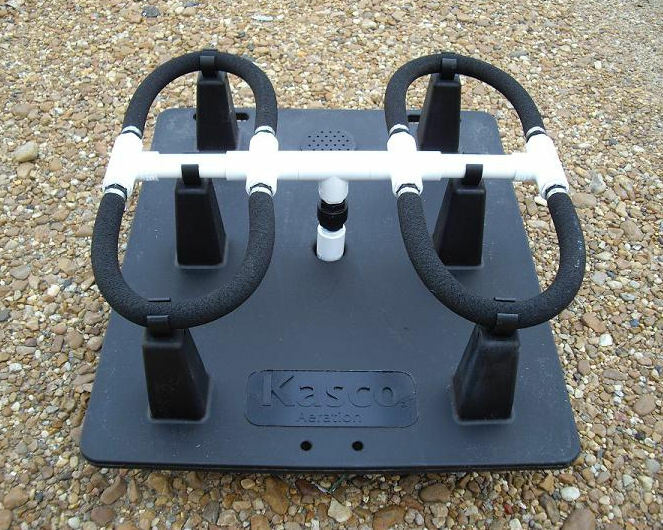 Kasco® surface agitators (pond aerators) and horizontal circulators don't produce large displays like fountains, but can often provide more energy- and cost-efficient aeration and circulation of shallow areas. 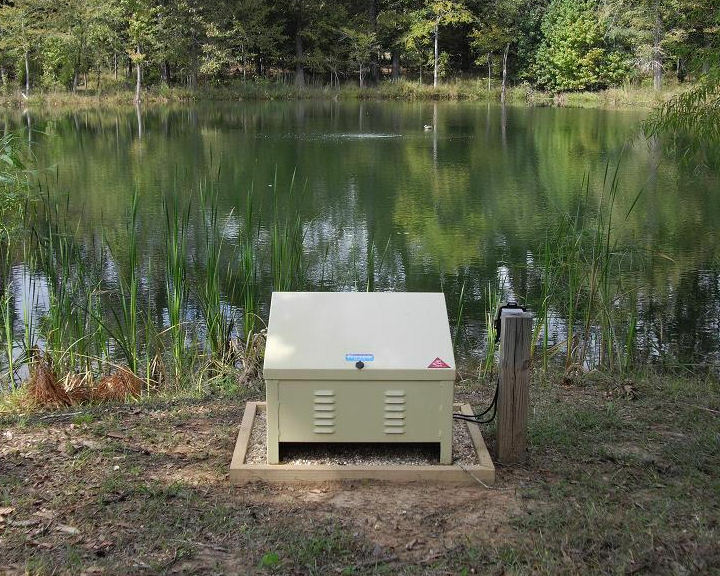 Although other factors may be involved, most fish kills in the South are related to low dissolved oxygen levels. Dissolved oxygen levels may decrease during cloudy weather (phytoplankton and other plants consume more oxygen than they produce), when vegetation dies, or when a lake "turns over". It only takes minutes of exposure to low oxygen levels to stress or kill sport fish. 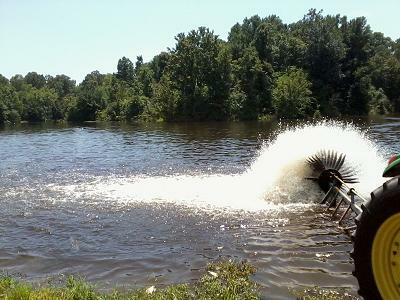 We have tractor-powered paddlewheel aerators available for rent. These devices—originally designed for commercial fish farms—quickly aerate and circulate large volumes of water. If fish are seen near the surface "piping" for air, implementing emergency aeration may mean the difference between losing a few fish and major fish kill.